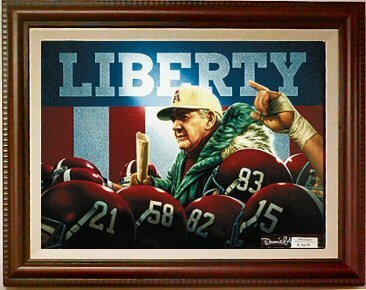 "Liberty" - Daniel Moore's commemoration of Coach Bryant's final victory. Coach Paul "Bear" Bryant's final victory occurred at the 1982 Liberty Bowl against Illinois. "Liberty" depicts Coach Bryant's triumphal ride off the filed where the numbers on his players' helmets symbolize important milestones in coach Bryant's life; his birth in '21, his becoming head coach in '58, his retirement in '82 and his death in '83. Finally, 315 identifies the victory that elevated him over Alonzo Stagg to become Football's winning-est coach.